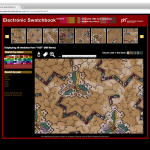 The Powerhouse Museum in Sydney has “Electronic Swatchbook 2.0” online. What is it? 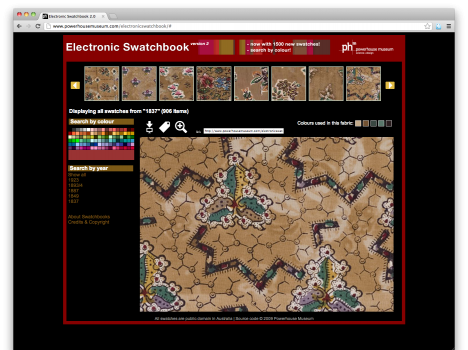 High-quality scans of fabric swatches dating 1837-1923 from various industry swatch books in their collection. 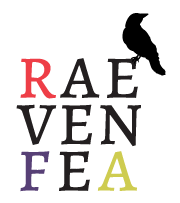 This is a great resource for historical costuming and quilting. I’m totally geeking out, thinking about what repro fabrics I’ve seen that look simliar and what techniques I can decipher. Powerhouse Museum, I think I love you. I was not at Quilt Market in Houston last week, but something I made was. while you were there (on a person, of course, not my decrepit, listing dress form)? It was a simple reversible wrap skirt made from this tutorial on Sew Mama Sew. The purple side is the cheater print from Asbury (available in January), the yellow is a print from Frippery (in stores now), and the waistband is another Asbury print, all by Thomas Knauer (who, incidentally, was likely wearing the skirt if you did see it, hint hint). And, because I’m supremely lazy and technology-savvy, rather than draw out the pattern on paper like the tutorial suggested (which required finding my roll of craft paper, a straight edge, etc), I just mocked it up in real-size on the computer and printed it out. 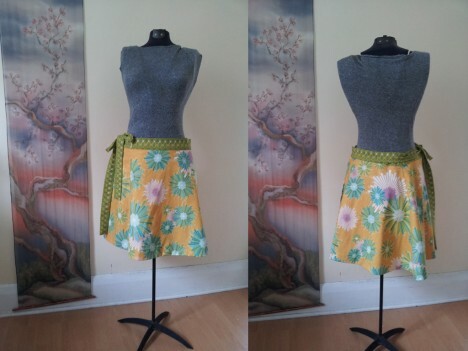 You reap the benefit: here is a downloadable pattern for a 34″ waist, approximately knee-length (20″) skirt. 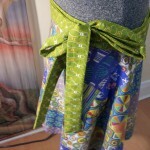 Well, if you’re 34″ waist ± an inch or two (it’s a wrap skirt, after all). Cutting instructions are included based on what I did. 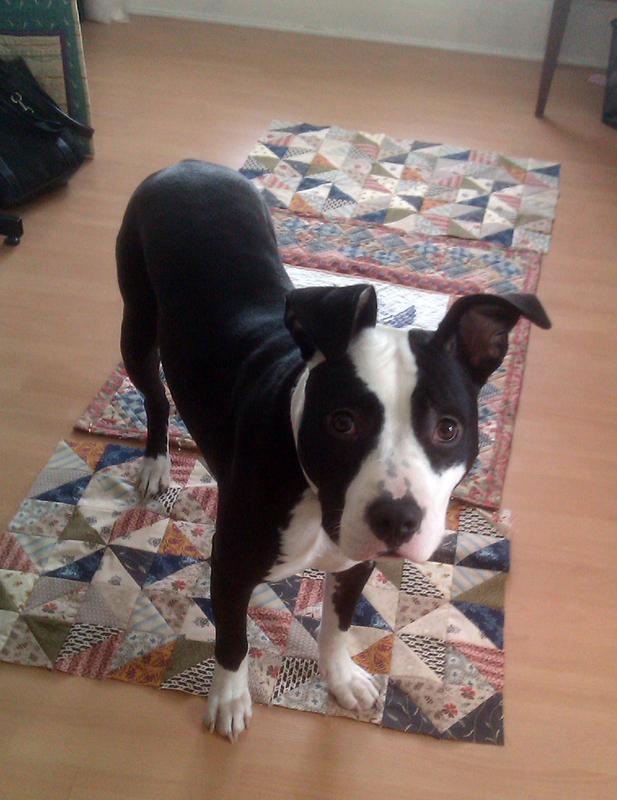 You’ll have to refer to Sew Mama Sew for the construction instructions, though. 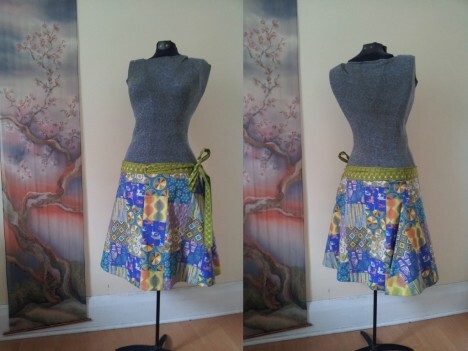 I foresee a skirt or two of my own from this pattern in the future… I just have to decide what to make it out of—oh, the options! 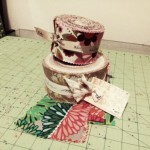 I’ve been using 2.5″ strips a bit lately—commonly called Jelly Roll strips. 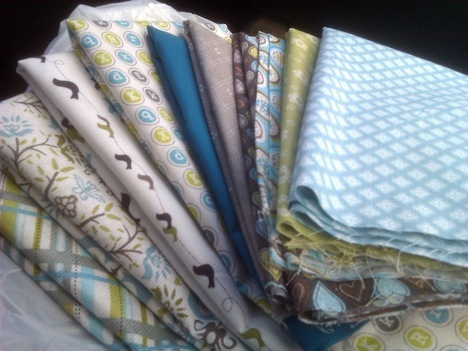 But, my recent purchases haven’t been fabrics by Moda, so I’ve quickly learned that not all rolls are equal. Here’s a breakdown of commonly available rolls and the number of strips included. 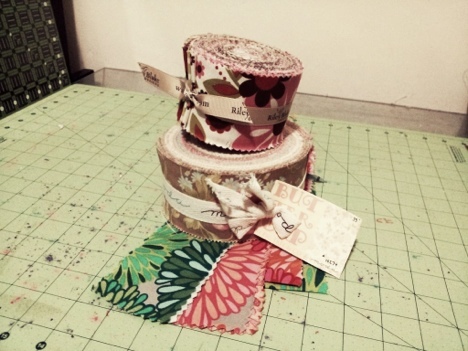 A Jelly Roll (which is a term specifically for Moda rolls, but is commonly used to describe all strip pre-cuts) is a pre-cut fabric assortment of strips measuring 2.5″×Width of Fabric (~40–44″). They typically contain at least one strip from every print and colorway in a fabric collection, and sometimes contain duplicate prints to reach a specific strip count. How many strips are in a Jelly Roll? 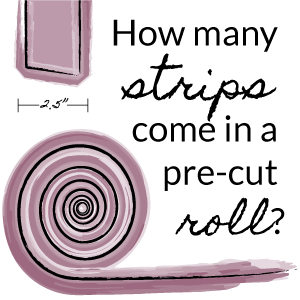 The number of strips in a roll varies by manufacturer, and sometimes even within a manufacturer’s offerings. * Riley Blake Designs has a few Rolie Polies made of blenders that come with as few as 11 strips, and at least one solids Rolie Polie with 45. 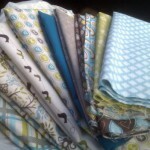 Free Spirit sometimes has 36 strips in their Designer Rolls for larger collections (and possibly other numbers). 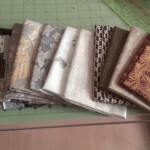 Kauffman has Solid Roll Ups that often come with 40 or 41 strips and batik sets with as few as 28. Strip count in a roll sometimes varies, even in the ones I didn’t mark with an asterisk, so always check the description of what you buy online or look for a number in store (or count, if you have to). There’s also the rare occasion that a strip is cut incorrectly and not caught by quality control (I have had this happen multiple times with Moda charm packs, less often with rolls), so when picking patterns to make with your precuts or planning out your own, try to build in a small margin of unused strips. And, make sure to count your strips before starting the project! 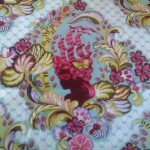 You can find these all in various online fabric shops and it seems like more and more local shops also carry them. 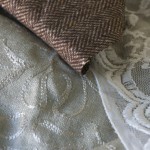 Depending on what fabric brands a shop carries, you may not be able to find every type in a single location. Prices also vary. You’re typically going to pay slightly more per equivalent yard (40 strips is just over 2.75 yards), and while the price generally relates to number of strips, that’s not always true. And, of course, manufacturers charge different amounts per yard (and have differing qualities of fabric), so the different roll prices will reflect that. Watch out for store-made rolls! Not that they are inherently bad, but be on the look out for store-made rolls as opposed to official releases by the fabric companies. These rolls may have a different amount of strips, fewer prints or more duplicates, be cut in half the width of fabric instead of full, have strips larger or smaller than 2.5″ tall, or any number of other variations (yes, I’ve purchased one with all of those attributes). Official rolls typically have printed tags and are bound by ribbon printed with the manufacturer’s name or come shrink wrapped. Know what you’re buying, ask questions if things aren’t clear, and be happy sewing! If you think I’ve missed any strip collections, please let me know in the comments. It’s time to get back to work on the Steampunk costume, don’t you think? The first step is finishing up the corset, since it is the base of all the other top-layer items. I’ve picked apart the drill mockup so that I can use those pieces for interlining/strength, and now I’m ready to cut into the fashion fabric and actually construct the final corset. The problem is, I can’t decide what to make it out of. 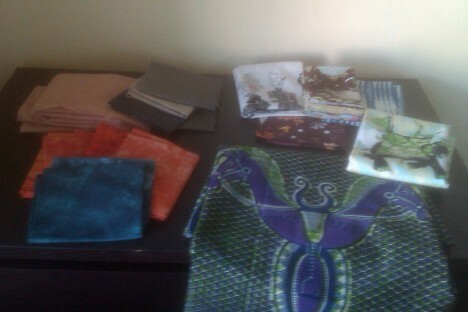 I’m sticking to fabrics I already own (and own in enough quantity). The fittings are gold/brass, so it all needs to match that, too. 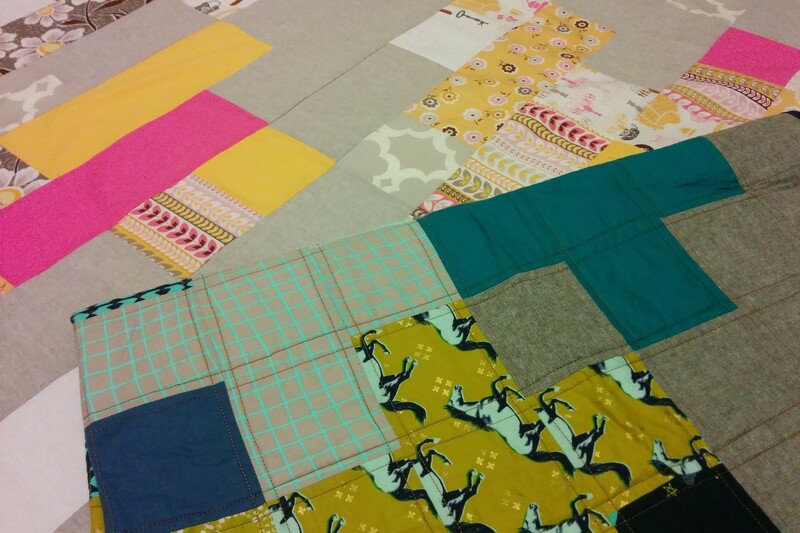 One piece of advice I see in or on just about every quilting blog, forum, magazine, book—you name it—is that if you care at all about your quilting (which you obviously should), you absolutely have to buy “quilt shop quality” (QSQ) fabric. If any rule can be broken in quilting, I think this one can once you have some experience under your (piecing) foot. It’s difficult to explain to a new quilter what good quality fabric feels like—drape, good weave, and hand are hard concepts to describe with words. So blanket rules may save some heartache, but that limits the rest of us—rule breakers, experimenters, or just people with a solid grasp of the craft—to a fraction of the fabric that is out there. 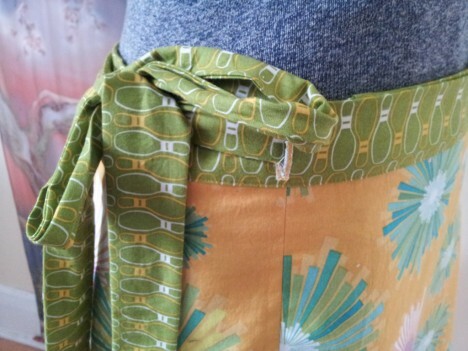 There are valid reasons why not to buy big-box fabric. Sew To Speak in Columbus, OH is one of my favorite shops, and I couldn’t keep myself from picking up a few various FQs, including one from the Ghastlie Family Reunion. …until the show, at least—and with a bit of history to boot. I just have a small amount of work left (namely adding a hanging sleeve), then I’ll be ready to ship it off mid-February. 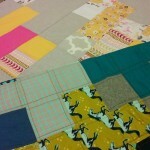 The bi-weekly So You Want To Quilt group is starting up with a new project this month: a quilt based on the Stack-n-Whack kaleidoscope technique (there are a few books about it, like Stack-n-Whackipedia). Our teacher is designing a wall hanging that we can make, but seeing as I’m more of a quilt gal myself—and lack any restraint to keep things simple lately—I’m making my own design (more on that in coming weeks). In the 18 years I lived in Kansas City (or 21, if you include going home on college breaks), I never once stepped foot in a fabric store that wasn’t a JoAnn or Hancock (well, except for that fancy special occasion place on the Plaza). Now that I only make it back twice a year or so, I am so sad that I missed the opportunity to be part of what seems to be an awesome Modern Quilting community there—and am jealous of the shopping opportunities. During this last trip, I finally made it to two shops in the Missouri/Kansas region—one in Overland Park, KS and one in Camdenton, MO (the Lake of the Ozarks). I really restrained myself, as I hadn’t budgeted for fabric shopping on the trip, but both will definitely be stops on future trips.